The Girl with the Dragon Tattoo meets Now and Then. The first act of the movie is all about this teenage girl raised in the wilderness violently killing people to club music. The second act was the same girl learning how to have a friend and kiss boys. In the third act, she becomes a clown and runs a cat farm. This movie was interesting. Interestingly weird, to be more specific and grammatically awkward. The music – which I found out afterwards was performed by The Chemical Brothers, which made a lot of sense – was very clubby and strange. But it went with the creepy zooms and erratic cuts. (Ed note: I’ve had to go to the thesaurus 3 times so far to find synonyms for “weird.” It seems to be the only way I can think of to describe this movie). I like mood setting, really I do. But this was jarring, and a sharp contrast to a movie I feel like wanted to take itself seriously, justifiably so. 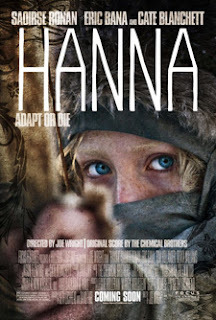 Saoirse Ronan played Hanna wonderfully, but please don’t ask me to pronounce her name. 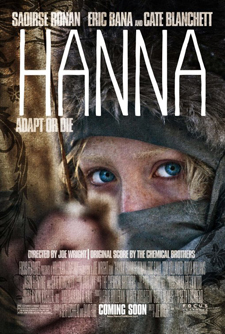 The story involved some CIA cover up of a DNA breeding program that Hanna was a part of. It played with the concept of letting a little bit of information leak to the viewer at a time, which was enough to hold my interest. The best scenes though, were that of her falling into favor with this traveling family, specifically the makeup wearing, boy-crazy teen mentor which reminded me of every Gabby Hoffman movie ever made. And that’s a compliment, for those that couldn’t tell. If only it weren’t so darn… what’s the word I’m looking for?